Frances CD of Italian Mandolin Sonatas was released in the autumn of 2006 on the Claudio label (CR5581-2). 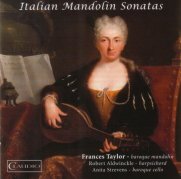 Frances Taylor, Britains leading exponent of the Italian school of mandolin playing brings to life music from the late Baroque in her CD Italian Mandolin Sonatas. The Italian mandolin tradition with its bright resonant sound and delicate ornamentation blends seamlessly with the plucked accompaniment of the harpsichord and is underpinned with the sonorous quality of the cello which serves to strengthen the harmonies. Mandolin recordings sometimes use harpsichord, or in its place guitar, but the added luxury of the cello is used with great advantage in this recording. Music from the late Baroque embodied the ideals of the Enlightenment  that music was natural and pleasing as opposed to the complicated counterpoint of earlier composers. Frances Taylor presents a programme which is relaxingly light, airy, simple, and tasteful, at times elegantly expressive and always full of vitality and life affirming energy. This recording features six sonatas, two by Giovanni Battista Gervasio, one of the most influential figures in the mandolin world during the 18th century, one by Domenico Scarlatti, better known for his prodigious output of keyboard compositions, and one by Emanuele Barbella, a well known violinist and teacher mentioned by Dr. Charles Burney in his travel writings. Also included on the recording are two other sonatas, one by Addiego Guerra and one by Giuseppe Giuliano. All the sonatas are played on period instruments. The mandolin, made by Chris Allen and Sabina Kormylo 1997, is a copy of Antonio Vinaccia 1772 in the Victoria and Albert Museum.